Add all of the batter ingredients to a blender and puree until smooth. Set aside and let rest for 10 minutes, or cover and refrigerate up to 12 hours. Stir before using. Heat a 10” crepe pan or flat bottomed non-stick skillet over medium-high heat. Once hot, pour about 1/4 cup of batter and spread out in a circular shape to cover the entire pan. You want to create a very thin layer. Once the bottom begins to become toasted and golden, loosen the edges with a spatula and flip to toast the other side. Continue to flip another 2 times until the batter starts to crisp. Add desired filling - chocolate hazelnut spread and Edam cheese are traditional to the Yucatán Peninsula. Roll up into a big and wide roll. As soon as, you remove it from the heat it will begin to crisp up like a wafer cone. Enjoy! Dear Patti, love your show I have saved your recipe for Marquesita’s on my homepage. I am just curious where from Eastern Europe your grandparents came from mine came from Czechoslovakia… so from one American with a Jewish Refugee background I am just curious about this I know you personally cannot answer every single question and maybe that isn’t any of my business or you might not even know like I said I’m just curious my boyfriend is Mexican and I was raised in a strict Baptist household even though I knew that I had grandparents who were Jewish and had kept it secret even after fleeting from Czechoslovakia. I can’t wait to try this recipe. Your juju made my mouth watering the way he made and enjoyed eating his. It sounded crispy . I was thinking of making it with eggs, bacon, cheese, avocado and sort off like a breakfast burrito. I fell in love with these during my family’s trip to Merida last year. Thanks so much for the recipe! Love your recipes, your show on PBS, and your lovely personality. This recipe looks amazing! Juju is such a charming young man. He obviously enjoys cooking with you! Aww thank you! Hope you like the recipe! Love your show, Pati. You make cooking looks easy & fun especially when you do it with your boys. 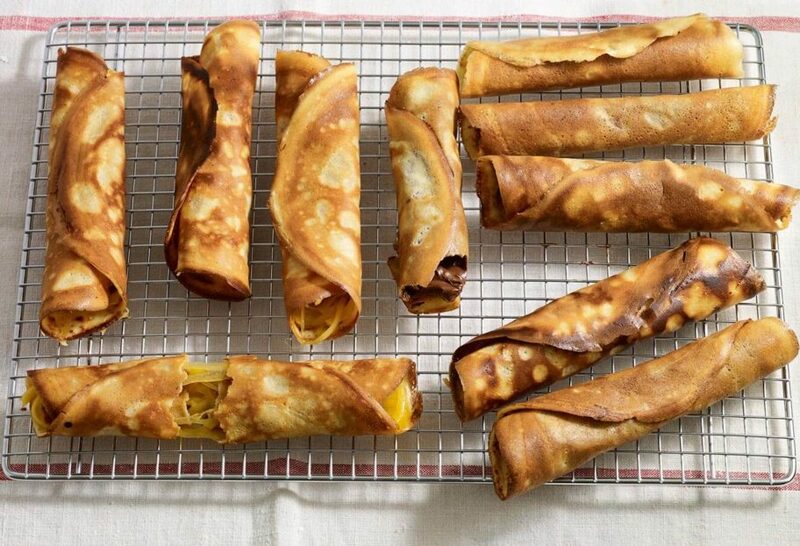 I would like to try this recipe since my husband loves crepes. Can I store the leftover batter in the fridge for later use? If yes, for how long? We are now empty nesters and I don’t think my husband & I can finish them in one eating. Thanks and more power to your show! Oh thanks for watching Atasha! Yes, you can store the batter, covered in the fridge for 5 days. Just whisk or stir well before you use again. Thank YOU Patricia for tuning in! Pati I love watching your shows and especially those where you have your boys help cook and sometimes they just wolf down what you create. My late wife cooked with my kids and I think that is why they all like to cook. She loved crepes and so that is why I have to try these Marquesitas! They look so good! Also I noticed you call your son JuJu. That is the nickname I gave to one of my daughters when she was little and she still goes by. It is not a common name so I was wondering if it is a given name or has a special meaning in your family. Thank you for your shows. Aww Bob thank you for this amazing message…Juju’s nickname is short for Julian but what a coincidence that that your daughter had the same nickname! I love Pati and when she cooks with her son’s I cry because I also had 3 sons the same age apart as hers, but now there grown and I’m old and miss them as children. I can’t wait to try this recipe it looks so good, but I just had heart surgery 2 weeks ago and can’t do much. I get tired so fast. I wish Pati was my sister, daughter, neighbor, or best friend so she could cook some time for me. Aww Francine…thank you so much for your lovely message. I’m so lucky to have my three boys. I hope you have a fast and healthy recovery.